Walking hand-in-hand late one afternoon on a beach in the North Shore area of Oahu two years ago, we enjoyed the sand between our toes while venturing toward ancient lava rocks, jagged in some places regardless of the lapping sea. Being the parents of two incredible children together, and also two children separately, we rarely get time alone. There we were, in paradise enjoying life, and celebrating our 14 year anniversary a few months early. I’m in New York City for Bridal Market every year on our anniversary and my sweet (patient) husband is with our younger children…at home, doing homework while I paw through gorgeous wedding dresses, attending parties, and generally having a lot of fun writing stories about my colleagues. 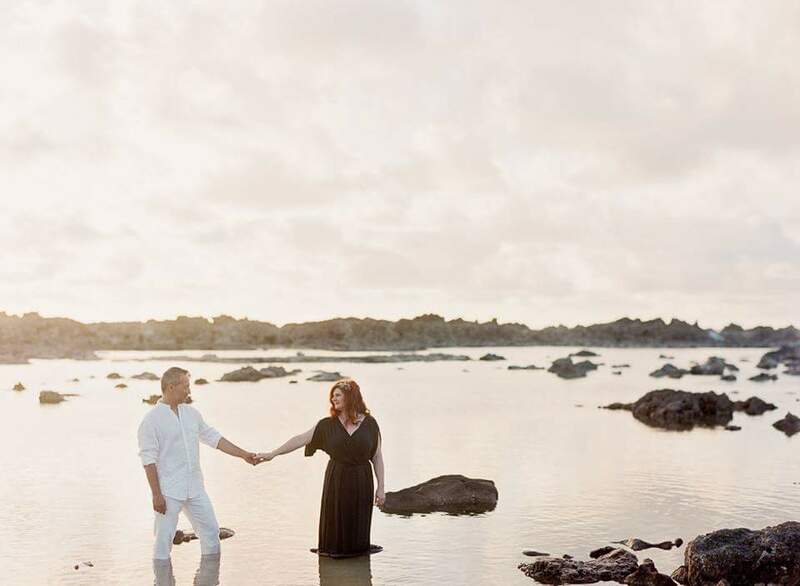 I couldn’t think of a better way to document our 14th wedding anniversary together than by having professional photos taken by my friend and fine art photographer, Whitney Huynh of Tulle and Grace, while in Hawaii. She instructed us with a few poses on the beach, eventually moving us into the water, which was deliciously warm. Since we were both fully clothed, it was a bit awkward walking into the water, but once we were there, we didn’t want to leave. The water was perfect, the salt air fresh. The sky was just a bit overcast, perfect lighting for great for photos, and the setting sun cast an ethereal glow on the beach. There were no waves. We were only slightly disappointed with the lack of wind. We wanted dress movement, and all of the other beaches we had visited had strong gusts of wind. Not this one. Holding my husband’s hand and looking into his eyes reminded me of why I married him in the first place. He’s logical, honest, secure, strong-willed, durable, and reasonable. Boy, does he have to be. He married me and I have very high expectations in my mate. My husband is also sweet and kind with our children. He’s a great husband and fabulous father. My family absolutely loves him. Whitney and I discussed this shoot months prior to the trip. She wanted lava rocks and crystals. I wanted a black flowing dress. In the end, we decided on Yin Yang. Balance. Our wardrobe colors represent life and death, darkness and light, poverty and wealth, hot and cold, day and night, and Heaven and earth. Marriage’s ups and downs. Life, and ultimately, death. Shadows cannot exist without light, and the white linen shirt and pants, the yang, represents the sun, logic, activity, masculinity, and because Erick’s last name is Luces (which means “lights” in Spanish), white was more than suitable for him. My black dress, yin, is the symbol of femininity, darkness, softness, and the moon, and balances the pure white of his clothing. My moonstone jewelry symbolizes mystery and hidden truths, the magic of the moon, and among many other things, protection to those who travel at night or over water, like I so often do. We complement one another in these photos as well as we do in real life. 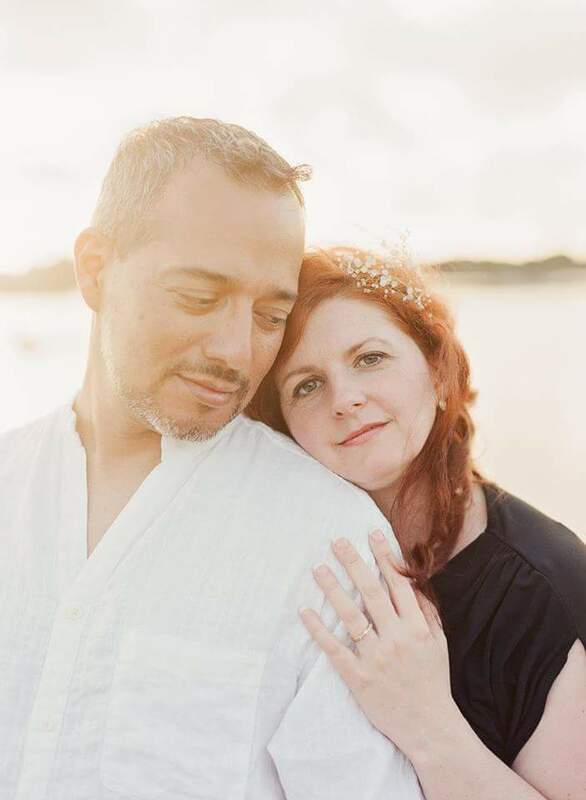 Marriage isn’t really a “fairy-tale” story full of only happy times; it’s an investment and the result of the time and effort a couple pour into it. This anniversary we travel to Paris, the City of Lights, of Love. I hope to have one great photo of us together to share with you!